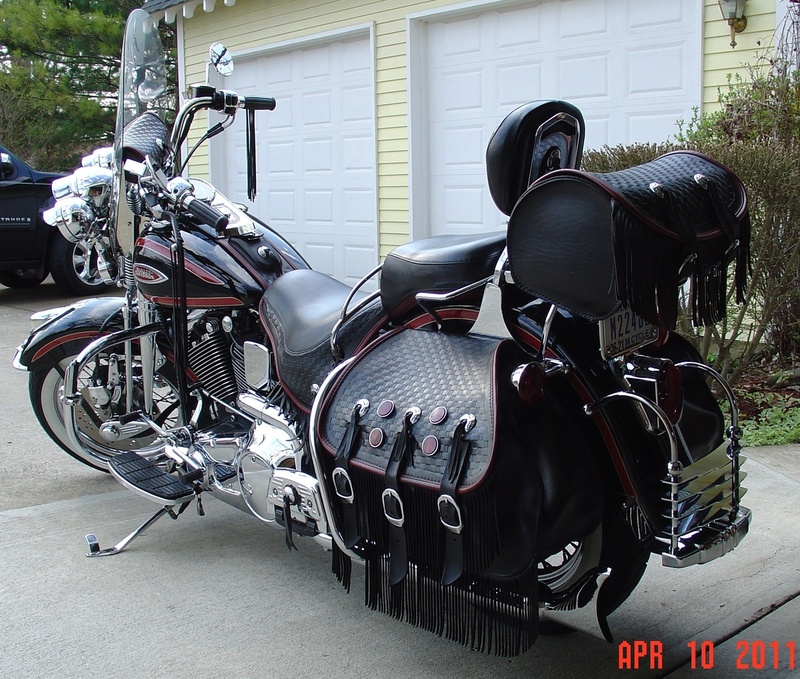 In Motorcycles > Harley-Davidson Motorcycles > Show & Tell. 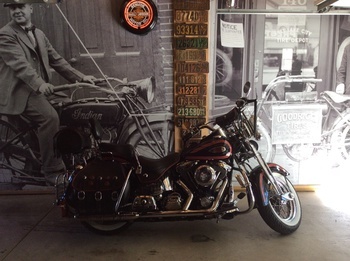 I bought this Harley-Davidson (FLSTS) new in September 1998. It had 1 mile on it. I have put alot of miles on this motorcycle. The bike still looks brand new after all these years. When I looked this morning it had 90,890 miles. Have a great day! Friday night July the 13th 2012 on my way home from out riding turned 94,000 miles. Knock on wood still running strong! Friday August 9, 2013 out riding with some friends and turned 97,000 miles today. Friday July 11, 2014 out riding and turned 98,000 miles today. 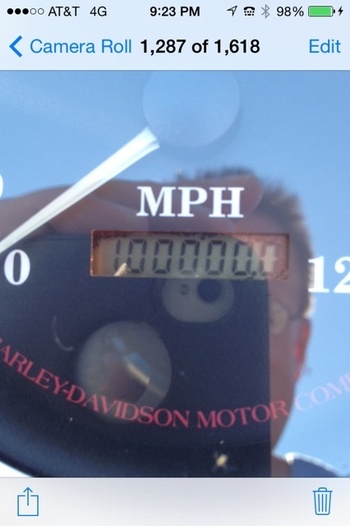 September 15, 2015 my bike finally turned 100,000 miles. Still running good and looking good! Thank you kerry10456, rocker-sd, oilman514, Pop_abides, MMM, trukn20, chevy59, Chevelleman69 and rustyboltz! One sweet looking lady! Very nice indeed. I've been itching to get me one for a couple years now. I kept thinking the urge would subside, but it hasn't. And now seeing my next door neighbor get him an 09 and you with two, well, this might be all it takes to push me over the friggin edge. Thanks a lot Michael. LOL No, but seriously, she's a fine looking machine and bet she never gets a headache either... Take care & enjoy. Beautiful , love to see those miles on your bike , thats what harleys are built to do. Thank you metalman for the comment, nice looking gal Velvet! Be safe my friend on the highway! Sometimes a bike is better than a woman, once you turn off the ignition it sits quitely until turned on again! LOL However, a female companion is nice and finding the right one can take a life time. 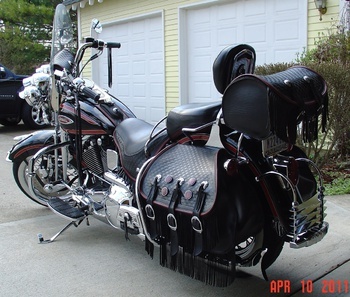 Anyway you have a very nice ride, I share the same desire, I have an 03 Heritage Softail with a sidecar when my better half riding and I go riding as we are both handicapped, and a 03 Heritage Springer for if and when I prefer to leave the baggage at home (which isn't too often). Ride on Brother! But I Will admit too a little momentary envy. Good Stuff.... Gotta Love The Kids!!! Only 90980 miles...just a pup.LOL I have a 98 Suzuki intruder with 30 something thousand miles doesn't look as new as yours. (Of course it has survived hitting two deer and got backed into once).So this is your boy...If I were gay I'd ask for his hand.You got a pic of Scarlett? Thank you Hedgewalker! If you look at my site you will see Scarlett. Interesting fender guard you have there. Never seen one like it. I meant you in the third pic!! You have great eyes! I didn't even notice that til you mentioned it. Scarlett's brother is a dandy! When you DO meet the right lady, she should be very pleased to be "mom" to THESE two kids! Thank you packrat-place for stopping by and showing some love! To die for ! Have always wanted one, but never could afford it. Drool when I see which a beauty as your Harley. Pulled up to post office last week and one parked next to me. I just sat in the car and daydreamed ! My hubby says, he knows, if I had one, I'd be "outta here and on the road". He would have to put a tracker on me and follow it on google. (grin) Take good care of your boy. Thank you AntigueToys for stopping by and showing some love on my Harley! Thank you oldskool for stopping by and showing some love! Also welcome to CollectorsWeekly. 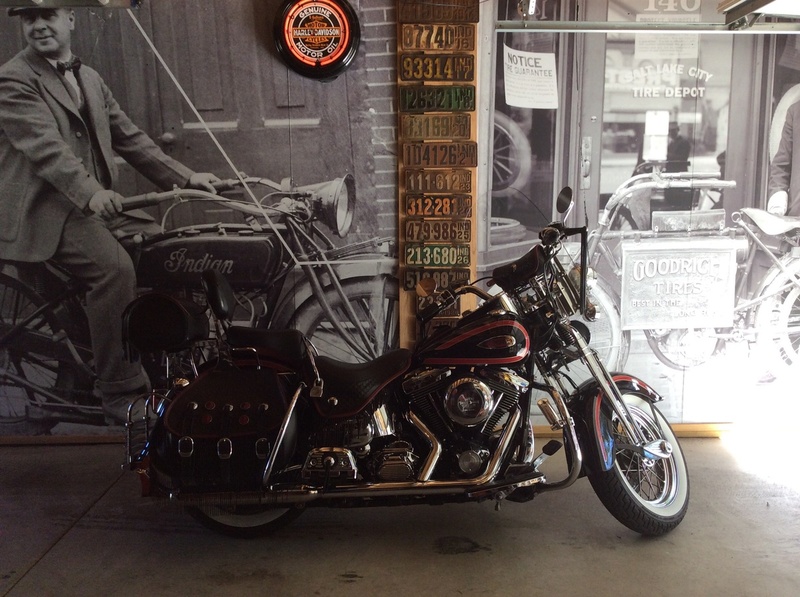 Thank you lmundell for stopping by and showing some love on my Harley Davidson! Have a great weekend! Thank you thomatroutman for the love on Harley! Have a wonderful Sunday! Thank you bratjdd for the love on Harley! Thank you mikielikesigns2 for the love! 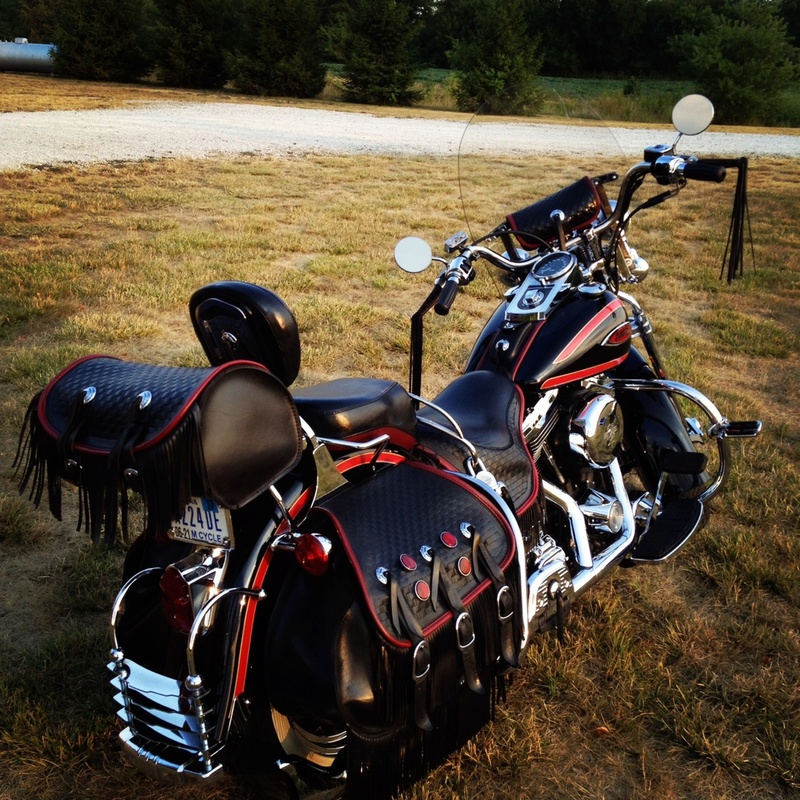 Thank you Hems303 for the love on Harley and the nice comment! Can't wait to see that Norton, post those pictures. Love it, can't believe I missed this!! Thank you petey for the love and the nice comment! Be safe out there on the highway!! Out riding today with some friends and Harley turned 97,000 miles! It's been a great Harley Davidson!! Keep on ridin Micheal, best way to see the sights and experience the freedom this great continent has to offer! I'm looking forward to Milwaukee in Aug. for the 110th Aniv. Should be a blast! Cheers!! Thank you Bernie for the comment! Enjoy your trip and be safe! Again thanks for stopping in! Thank you sugargirl, RAD21289 and ttomtucker for the loves! Thank you sanhardin for hitting the love button again! Thank you Jono for the love! Have a great week! Thank you nutsabotas6 for the love and the comment! I love that bike and can't wait for warm weather. Thank you rkmontg342 for the love! Have a great week! Thank you Beachbum58 for the love! Welcome to CollectorsWeekly! Thank you Thadeauz for the love! Thank you Welzebub for the love! Have a great weekend! Welzebub, thanks for leaving the nice comment! Be safe! Thank you stelios for the love! Thank you Antiqage for the love! Have a great afternoon! Thank you snowman3 for the love! Out riding yesterday and my old friend turned 98,000 miles. It's been a good Harley Davidson! 75th Annual Sturgis Motorcycle Rally, August 3-9, 2015!!!!!!!!!!!!!!!!!!!!!!! Thank you southcop for the love and the info! I've been there 4 times and would love to go again. Thank you vintagegirl66 and AntigueToys for the loves! Thank you CindB for the love! Thank you Virginia.vintage for the love and the nice compliment! Thank you Nicefice for the love! I posted a photo of the odometer. Merry Christmas! Thank you Neighborguysfan for the love! Thank you thegatherer for the love! Always appreciate you stopping in! Thank you ttomtucker, kerry10456, buckethead for the love! Thank you Bensallright for the love! Thank you Bank2collect for the love! Thank you aura for the love! A fellow rider and collector! I thought 50k mi. on my Duc was a lot. Thank you VtgCat for the love and commenting! Be safe! Mine is just a year younger..'97..Model FXTS...Nice one Michael! Allways Loved it! !